For your completed Mini-tourneys & Tournaments, you can now review your own cribbage games visually hand-by-hand, move-by-move. You can only review your daily list of cribbage games if you are logged in. You can select any day and view your games played during that day. By reviewing and analyzing your games, you can see what mistakes were made in the game, you can learn your opponents' styles and preferences and bring your cribbage playing skill to a new level. When you select your cribbage game to review, you will see a display similar to the one below. The picture below came from the real cribbage game played between players 'connie2699' and 'idontknow'. Cribbage game starts with the selection of 2 cards from dealer's and pone's hands for the dealer's 4-card crib. For easy viewing, the dealer's selections of 2 cards for the crib are shown first. After the crib selections, the Starter card is open and the pone starts. The current hilighted move is the 1st move of the 1st hand. It's onestar15's (dealer) turn -- he puts 4 of Diamonds into own crib. The textual description under the board also states that "onestar15 puts 4 of Diamonds into own crib". 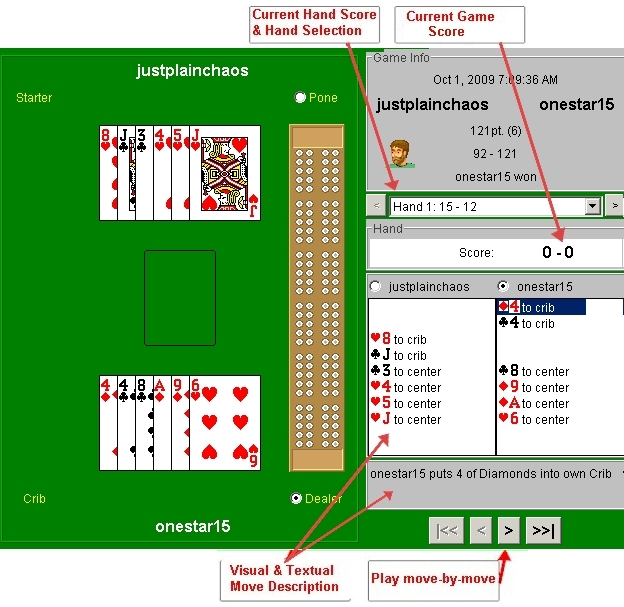 If the VCR-like 'Play' button is pressed once in the real Cribbage Viewer (as opposed to the picture below), this move will visually play out with 4 of Diamonds sliding towards the crib area to the left of onestar15's hand.